A notice indicating any current restrictions. 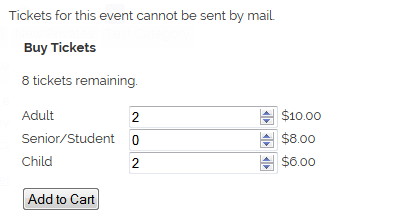 In the shown example, the event is happening too soon for tickets to be shipped by mail – when you’ve configured a number of days it general takes for tickets to be shipped by mail, that option will be automatically restricted if an event is happening too soon for the tickets to be shipped. The number of tickets remaining for the event. Fields to select the number of tickets for each ticket type, along with the price of that ticket. In this example, the tickets are being sold using “continuous” counting, so the number of tickets remaining is displayed above the ticket types. If this was being sold using “discrete” counting, the number of tickets remaining for each ticket type would be shown. When the event is added to the cart, a notice is displayed that indicates that the cart has been updated and providing a link to the shopping cart page for the user to complete their purchase. Additionally, if you’re using the Quick Cart (which can be added to a theme filter, via a widget, or via the shortcode “[quick-cart]”), the number of tickets in the cart and the total price of those tickets will be updated at the same time. The “Add to Cart” form is not the only way to add tickets to a cart. You can also add tickets to a cart using a link. The format for an add to cart link is /cart_page/?mt_add_to_cart=true&event_id=POSTID&ticket_type=TYPE&count=COUNT. Try it: Add 2 adult tickets to demo event. My Tickets supports four types of tickets: e-tickets, printable, will call, and postal, to try and best integrate with your event work flow. The type of ticket purchased is determined at the time of payment, so it’s not possible to mix and match events and ticket types: all events need to be sold with the same available types of ticketing. E-tickets are intended to be presented at the event using a mobile device. You can use your own mobile phone with any QR code reader to scan the ticket and verify it. Printable tickets are the same as e-tickets, except that they’re designed to be printed. You can also scan the QR code on a printable ticket to verify it. Will Call assumes that you produce your tickets as a separate process, and will simply produce a report of purchasers to check against and prepare tickets for pick-up. You can produce a list of ticket purchasers and the tickets they purchased from the reporting tab in the My Tickets settings. Postal tickets assume that you will print a ticket for the purchaser and ship it to them. My Tickets allows you to set a single price for shipping that will be added to an order; it doesn’t provide any method to automatically produce shipping costs. As an administrator, you’ll have access to view the printable ticket for any purchaser, so you can use that to print a ticket if you wish, or produce tickets using a completely independent process. You can enable any combination of tickets and the purchaser choose the type of ticket they want to purchase. 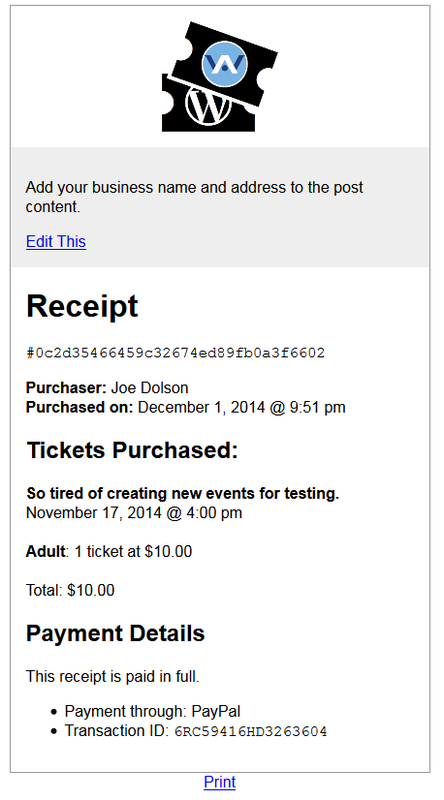 E-tickets and printable tickets can be extensively customized using theme template files. The templating in My Tickets includes a library of templating functions that you can use in your ticket templates. Immediately following a completed cart submission, purchaser will receive a notification from your web site about their purchase. The information included in that notification email is set in settings, but it should always include a link to the purchase receipt. Purchases that were made using an off-line payment type will still receive a receipt link, but in the ‘Payment’ section of the receipt, it will indicate that the payment has not yet been completed. Once you mark the purchase as Completed in the Payments section of the WordPress admin, the receipt will include those payment details. The text “Add your business name and address to the post content” is customized by editing the WordPress Page My Tickets creates for your receipts. This is recommend content, standard for a receipt; but you can add any information you need onto your receipts. Receipts can be extensively customized using theme template files. The templating in My Tickets includes a library of templating functions that you can use in your receipt or ticket templates.